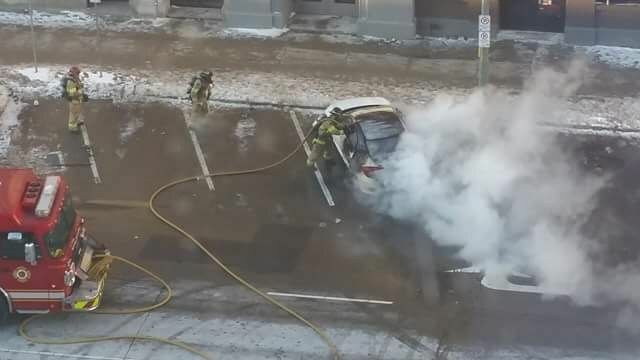 One man is facing an arson charge after a car was engulfed in flames in downtown London Wednesday afternoon – a blaze that sent two people to hospital where they remain in critical condition. 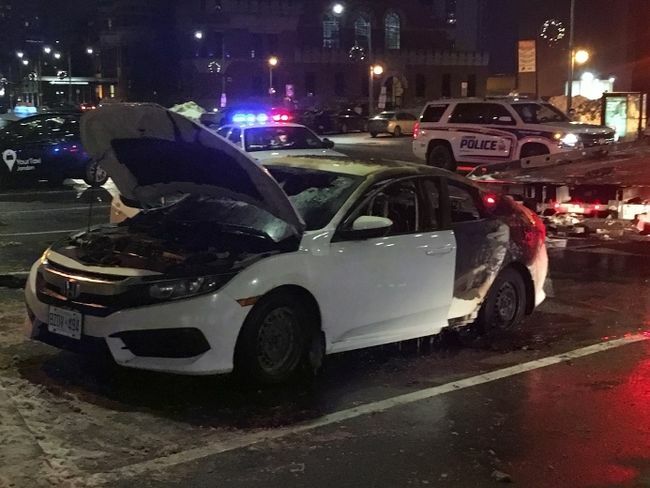 Police say two men who knew each other were in a car parked near the Dundas and Wellington streets at about 4:15 p.m. One of the men set fire to the inside of the vehicle while both were inside. Both men jumped out of the white Honda and put out their burning clothes while the interior of the car continued to burn. 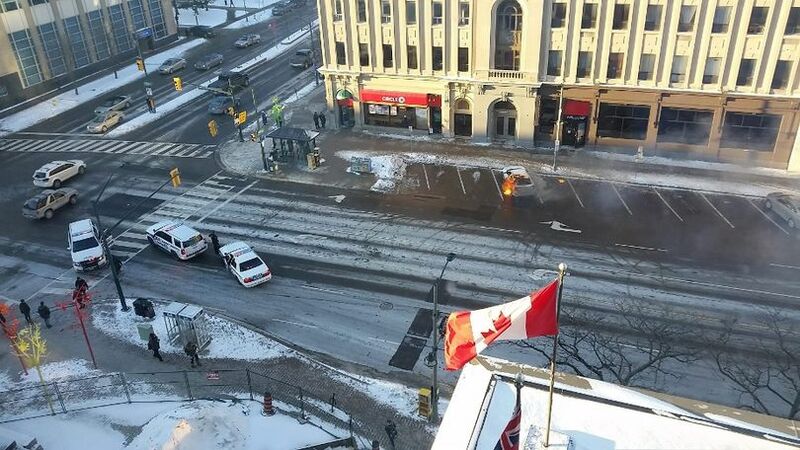 Two London police foot patrol officers that were in the area arrested one man almost immediately. The victim was found inside a nearby store. Both remain in hospital in critical condition with burns. William McDonald, 28, of Thamesford, east of London, is charged with arson causing bodily harm, aggravated assault and breach of a recognizance. London police are leading the investigation with the help of the Office of the Ontario Fire Marshal. Declining to disclose additional details about the fire probe, assistant deputy fire chief Jack Burt said the vehicle was removed from the scene and taken to a different location where the investigation is continuing. 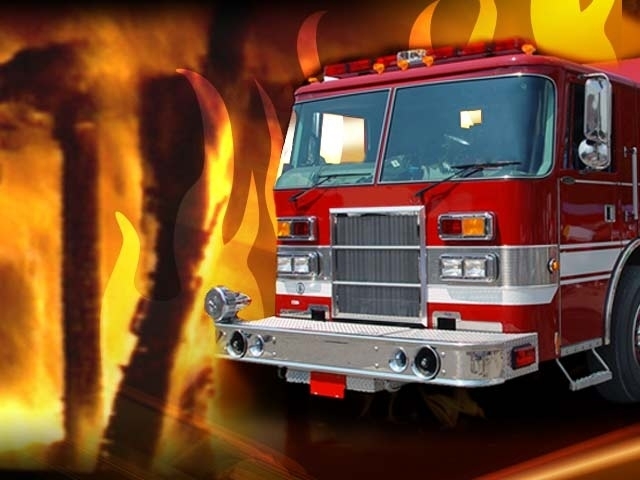 An Ontario Fire Marshal investigator arrived Wednesday evening, Burt said. The provincial agency probes fires that result in serious injuries or deaths, ones that cause more than $500,000 damage, blazes at homes for vulnerable populations, explosions or incendiary fires, arsons and cases linked to criminal activity, like drug labs. 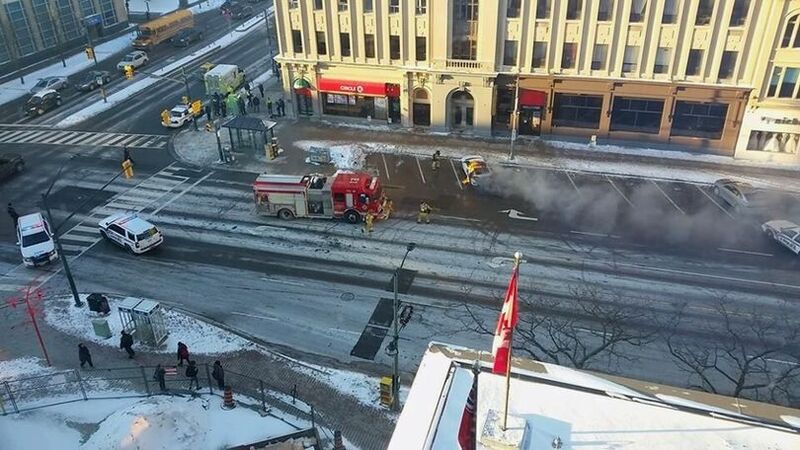 Scott Ross, who watched the scene unfold from an apartment on Dundas Street, said at least two people were inside the car but jumped out, screaming, as the vehicle was engulfed by flames. Const. Josh Kenny said police responded to the fire shortly after 4 p.m. The victims were taken to hospital but police weren’t updated on their status, he said. London police said they are expecting to release further details about the case Thursday. “It’s obviously still under investigation,” Kenny said. Video captured by Ross shows a bag or backpack on fire, several feet from the white Honda. Firefighters descended on the scene and extinguished the flames, which appear to have been concentrated in the backseat of the car. Ross said he’s used to some excitement near his apartment — he remembers the massive sinkhole at the same intersection back in 2007 — but cited Wednesday’s fire as one of the wildest episodes.